Speedy the cheeky house bunny: Remember Remember the 5th of November! Today is Guy Fawkes Night,so remember to stay safe everyone!And for those who are staying home here's a video of so Bonfire night fireworks in London from last year! While I love fireworks, Bentley is definitely NOT a fan. Have a great time! I hope it won't be too loud Speedy. The fireworks look so cool. We are glad we won't have fireworks tonight. Hope everyone is safe who does! Stay safe from the boomie celebrations Speedy! Great video. Looks like some big doings Speedy. Stay safe. Hmmmmm Seems we fink weez heard of this once. Stay safe Speedy. Ciara is very happy we are far enough away so we don't have to deal with those fireworks, but w hope all the humans have a fun night!!! I'm kind of glad this holiday isn't in the U.S.! It's too noisy! I hope you had a safe and sane night. Oh I missed it SPEEDY! I DID! I hope you did not get startled by all the hub-bub! LOVE! Ohhhh it looks like you have a noisy night coming up. 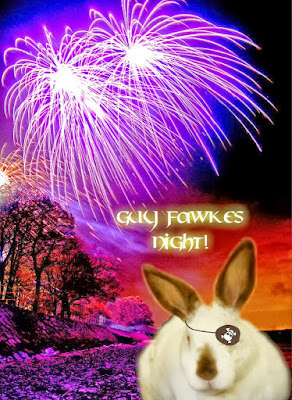 We aren't familiar with Guy Fawkes..
Hope you guys had a peaceful night and Speedy wasn't too bothered!